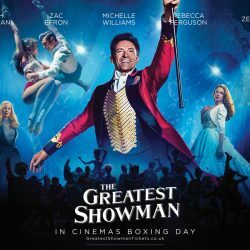 Our final night gala film is the wonderful The Greatest Showman. Watch it here in The Globe, or choose the Endecott House screening if you’d like to join in the sing-along! The drinks reception starts at 7.30pm downstairs in The Globe Inn, please arrive on time for your drinks, we will then announce when you can go upstairs for the film. With live music throughout the evening downstairs in The Globe. What’s so great about The Greatest Showman? Everything! They said it wouldn’t make it. They said it would never amount to anything. They said it was too loud, too weird, too lowbrow, too populist. They scoffed and scorned. But the sharpest words couldn’t cut it down. 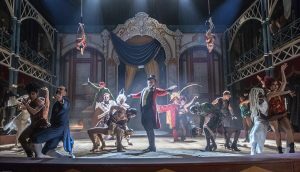 Months after its release, The Greatest Showman — a flashy musical starring Hugh Jackman as a sanitised version of PT Barnum — is one of the most successful box office hits of all time and with a soundtrack to match. The Globe Inn is a lovely pub in the heart of Chagford, winner of ‘South West Community Pub of the Year 2012’. Films are shown in the upstairs cinema where there is seating for 60 people. Talks and workshops take place here too.